I recently had the privilege of experiencing the world-debut of “Andy Warhol 15 Minutes Eternal” at the ArtScience Museum at Marina Bay Sands, here in Singapore. This week I bring you “Art à la Warhol“. We’ll look into key works that give us a window to a particular point in his life and the experiences that brought about that expression. 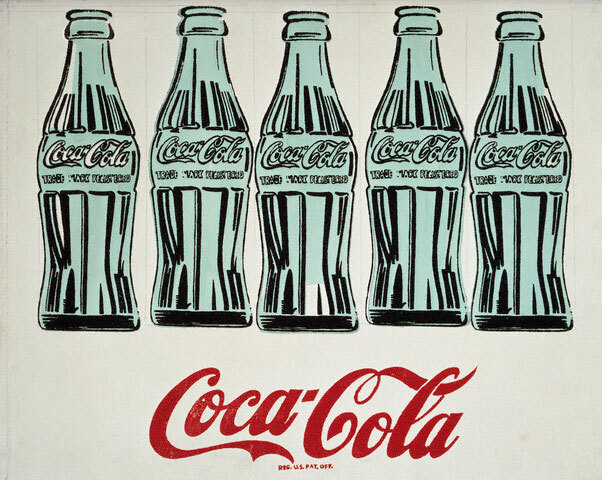 Then, we’ll do art projects to mimic the Warhol style. 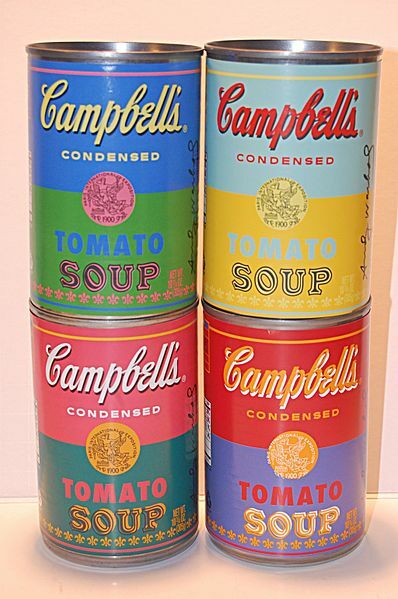 Why did Warhol paint Campbell’s Soups cans? 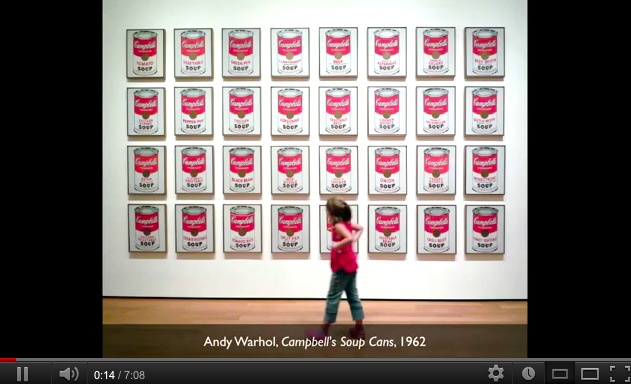 Several anecdotal stories supposedly explain why Warhol chose Campbell’s Soup cans as the focal point of his pop art. Story A: According to Ted Carey—one of Warhol’s commercial art assistants in the late 1950s—it was Muriel Latow who suggested the idea for both the soup cans and Warhol’s early U.S. dollar paintings. Muriel Latow was then an aspiring interior decorator, and owner of the Latow Art Gallery in the East 60s in Manhattan. She told Warhol that he should paint “Something you see every day and something that everybody would recognize. Something like a can of Campbell’s Soup.” Ted Carey, who was there at the time, said that Warhol responded by exclaiming: “Oh that sounds fabulous.” According to Carey, Warhol went to a supermarket the following day and bought a case of “all the soups”, which Carey said he saw when he stopped by Warhol’s apartment the next day. Another account of Latow’s influence on Warhol holds that she asked him what he loved most, and because he replied “money” she suggested that he paint U.S. dollar bills. 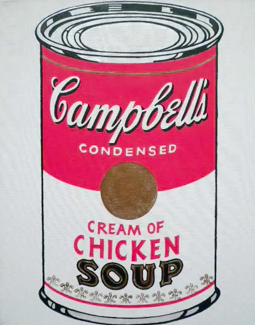 According to this story, Latow later advised that in addition to painting money he should paint something else very simple, such as Campbell’s Soup cans. 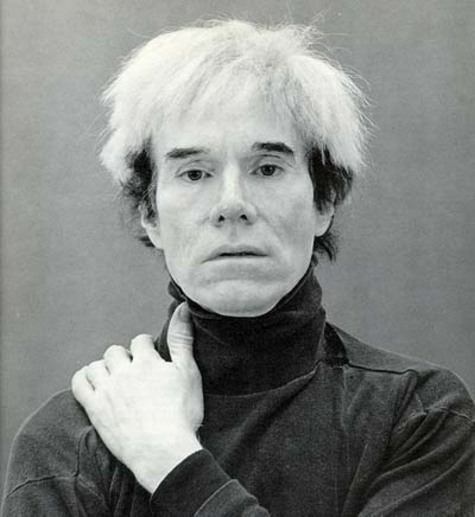 Andy Warhol: Oh God, yes, it’s true, the tin flowers were made out of those fruit cans, that’s the reason why I did my first tin-can paintings … You take a tin-can, the bigger the tin-can the better, like the family size ones that peach halves come in, and I think you cut them with scissors. It’s very easy and you just make flowers out of them. My mother always had lots of cans around, including the soup cans. Story D: Several stories mention that Warhol’s choice of soup cans reflected his own avid devotion to Campbell’s soup as a consumer. Robert Indiana once said: “I knew Andy very well. The reason he painted soup cans is that he liked soup.” He was thought to have focused on them because they composed a daily dietary staple. 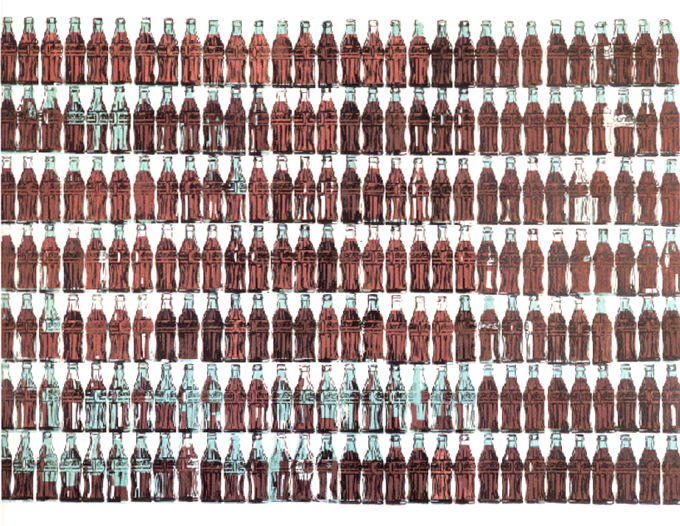 Others observed that Warhol merely painted things he held close at heart. He enjoyed eating Campbell’s soup, had a taste for Coca-Cola, loved money, and admired movie stars. Thus, they all became subjects of his work. Yet another account says that his daily lunches in his studio consisted of Campbell’s Soup and Coca-Cola, and thus, his inspiration came from seeing the empty cans and bottles accumulate on his desk. Choose an ordinary everyday object. Be on the lookout and take a photo of this object wherever and whenever you find it. 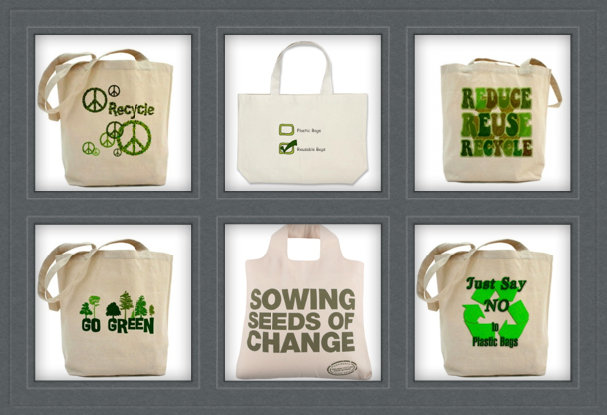 As you see, with my example, the objects have something in common – they are all reusable canvas bags. Arrange them as a row of images. I did mine using iPhoto. Here are my steps: create album with all the photos, select share-email, choose above lay-out, arrange photos according to your liking. Take a screen shot and crop. This entry was posted on September 12, 2012 by Paulina Constancia in Uncategorized.